S ome people are more visual, some more audial. For me, it was always sound that penetrated my senses deeper than anything else. I love sound, all kinds of sounds. Like young people everywhere, I found emotional refuge in music while I was growing up. Music was a drug that restored the chemical imbalances in my brain. I loved sound so much I even became a musician for a few years. So many of the sounds in everyday life sound like music to me, even voices, and that caused problems in elementary school. I was never very good at math, but I had the added challenge of a math teacher with a Swedish accent, Mr. Westman. Every word he spoke sounded like a note. His sentences collected into melodies. His classroom lectures were sonatas some days, jazz improvisations other days. Then, every once in a while my name poked through the melodic line: “Russell! What is the answer?” I didn’t even know the question. And even when he repeated the question, all I could hear was the music of his voice. I shook my head to signal my complete confusion, accompanied by the laughter of my far more attentive classmates. After I was adopted and living in my new home, my earliest memory is of the record player at my grandparent’s house next door. It was so tall I had to stand on a chair to turn it on. 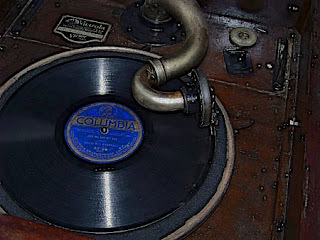 It was an old 78 rpm record player on the top of a mahogany cabinet that also contained a small black and white television and a radio. I was too young to actually place records on the record player, but somehow, I managed to turn it on and put the needle on the record. The booming sound of the music was magic. One afternoon I was listening to some old scratchy record of my grandfather’s that could have very well been “New San Antonio Rose,” by Bob Wills and His Texas Playboys. My grandfather was from Texas and I loved this recording. Suddenly the sound slowed down and the singing slowed down and I thought some kind of monster was emerging from the music. It sounded like the voice of some awful demon accompanied by a train wreck. It was incredibly frightening. That was the day I learned what electricity was, and what could happen if its magic flow was briefly interrupted, for the demon and the train wreck quickly disappeared, and like a movie run backwards, the music reassembled itself and rose again from the darkness of some terrible underworld. Yes, that was the day my grandfather taught me something about electricity. I also learned something very important that day about fear.